The 12th China Cup International Regatta culminated when it lowered its sail in Shenzhen, Guangdong Province on November 12. Over 1,600 sailors in nearly 200 teams from about 30 countries and regions competed in nine classes, the most in the event's history. The champions of the nine groups stepped onto the stage to end the closing ceremony. 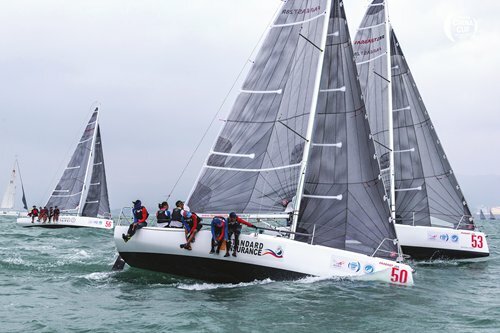 Wanhang Longcheer won the title of the most competitive class - Beneteau 40.7, winning their fifth trophy in six years and becoming the biggest winner this year. The year marks the 12th anniversary of the international sailing race that originated in China. In order to put new development plans into practice, this year's competition has been held in November, and lasted for five days unprecedentedly. In addition to the races, there were a series of sailing-related activities for citizens, such as the ceremony for the 2018 China Sailing Awards, an exhibition of ancient ship models and a Mirabeau photographic exhibition, which was known as "the Oscars in the sport of sailing." The year has also seen the highest level Marine Carnival in the race's history. Through these events, an increasing number of people could get close to regatta and fall in love with the sport. Guan Xiaoyu, the founder and COO of the China Cup International Regatta said they hope to advocate a lifestyle of embracing the ocean by holding the sailing race, in which family members, colleagues and friends could gather to sail and everyone has chances to access sailing training. Now, the race is facing its new opportunities. Before the 2018 edition began, Shenzhen had set a target for its development in the coming 30 years, that is, to help build it into a global marine center city in all respects by the middle of the century. Guan said, the China Cup International Regatta will continue to "go global" to broaden its horizon and "open up even more" to the outside world with its future direction and hold on to the long-term strategy of establishing intellectual property. They will be dedicated to delivering and promoting the culture of sailing and play a positive role in promoting international communication based on the sport of sailing. Furthermore, they will make contributions to Shenzhen's developmental goals as a marine, cultural center city and a pioneer of international culture innovation around the world by improving the race's soft power and global influence. When it comes to this year's race, the International Olympic Committee's executive board member Huang Simian said: " We can see the fruitful results of the race which has been attracting more and more people into the sport and has promoted the development of sailing sports in Shenzhen and China."